Deciding when to return to sport after injury is complex and multifactorial—an exercise in risk management. Return to sport decisions are made every day by clinicians, athletes and coaches, ideally in a collaborative way. The purpose of this consensus statement was to present and synthesise current evidence to make recommendations for return to sport decision-making, clinical practice and future research directions related to returning athletes to sport. A half day meeting was held in Bern, Switzerland, after the First World Congress in Sports Physical Therapy. 17 expert clinicians participated. 4 main sections were initially agreed upon, then participants elected to join 1 of the 4 groups—each group focused on 1 section of the consensus statement. Participants in each group discussed and summarised the key issues for their section before the 17-member group met again for discussion to reach consensus on the content of the 4 sections. Return to sport is not a decision taken in isolation at the end of the recovery and rehabilitation process. Instead, return to sport should be viewed as a continuum, paralleled with recovery and rehabilitation. Biopsychosocial models may help the clinician make sense of individual factors that may influence the athlete's return to sport, and the Strategic Assessment of Risk and Risk Tolerance framework may help decision-makers synthesise information to make an optimal return to sport decision. Research evidence to support return to sport decisions in clinical practice is scarce. Future research should focus on a standardised approach to defining, measuring and reporting return to sport outcomes, and identifying valuable prognostic factors for returning to sport. After a sports injury, the first question asked by most athletes (and coaches) is: ‘When will I (the athlete) be able to compete again?’ The answer to this question is rarely straightforward and is influenced by many factors. However, in most cases the goals of the injured athlete and the treating clinician (plus other stakeholders in the decision-making team, such as coaches, parents and managers) are the same—to facilitate a timely and safe return to sport (RTS). The Swiss Sport Physiotherapy Association along with the International Federation of Sports Physical Therapy and the BJSM hosted the first international RTS congress in Bern, Switzerland (20–21 November 2015). The aim of the congress was to present current evidence and guidelines in areas where sports medicine clinicians (particularly physiotherapists and physicians) play a major role in helping athletes to RTS after injury or surgery. The congress also acknowledged the important role of practitioners including orthopaedic surgeons, physiologists, coaches, and strength and conditioning professionals in helping athletes RTS. A half day consensus meeting was held following the congress (22 November), and 17 members of the consensus group participated. Prior to the congress, members of the consensus group were invited to write a narrative review on their topic area. Authors were asked to focus on summarising what is currently known and what are the future advances needed to advance knowledge in RTS. This information was disseminated to the group and used as a basis for the first round-table discussion, facilitated by two researchers (CLA and KMK), where the four sections of this statement were initially agreed on. Participants then elected to join one of the four groups, and each group focused on a different section of the statement. A section leader was nominated by the members of each group, and participants in each group discussed and summarised the key issues for their section. Each of the groups then presented their summary, and the 17-member group discussed the key issues to refine each section. This consensus builds on important formative work published over a decade ago, regarding the team physician's role in the athlete's RTS. In 2002, an expert panel representing the most prominent American orthopaedic, sports and family medicine member societies placed the team physician prominently as the gatekeeper of the RTS decision.1 The field of sport and exercise medicine has progressed considerably since then.2 Now, more than ever, decision-making models and ways of practising that are athlete-centred are advocated, placing the athlete in the position of an active decision-maker along with other relevant stakeholders.3–5 Our consensus reflects this athlete-centred approach. In recent years, the issues relating to the resumption of sports participation following injury have often been discussed using the term ‘return to play’ (RTP). Although RTP is common in sports medicine vernacular, the word ‘play’ is most applicable to the team sport athlete. This consensus statement is intended to be relevant to, and inclusive of, all sports and all athletes. Therefore, we use the term ‘return to sport’. To make an informed RTS decision, the definition of each RTS process should, at a minimum, be according to the sport (eg, ice hockey, squash, 100 m sprint) and the level of participation (eg, NCAA Division I, English Premier League, local recreational football league) that the athlete aims to return to. Success means different things to different people and is context-dependent and outcome-dependent. To the athlete, success might be defined by return to sustained participation in sport in the shortest possible time (goal focus). To the coach (and many athletes), success might be defined relative to the athlete's performance on RTS (performance focus). To the clinician, success might be defined by the prevention of new (or recurring) associated injuries (outcome focus). The decision-making team must collaboratively decide on how success will be defined, as soon as possible after the injury. Contextual factors influence the expectations and risk tolerance for RTS. These include the type of injury or illness (eg, acute vs chronic), the athlete's age (or stage of career), type of sport played (eg, individual or team, contact or non-contact), physical demands of the sport (eg, cutting, pivoting, landing), level of participation (eg, amateur professional), significance of upcoming participation opportunities (eg, championship match, Olympic final, preseason practice) and social and financial costs. RTS can be viewed as a continuum paralleled with recovery and rehabilitation—not simply a decision taken in isolation at the end of the recovery and rehabilitation process. As injury is an inevitable part of sports participation, optimal contingency planning for RTS might even happen before an injury occurs (or at least as soon as the injury occurs). Documentation should incorporate (but not be limited to): definition of sport, relevant contextual factors, RTS goals and performance on relevant clinical and functional tests to give evidence that could be used to guide RTS decision-making. It will also often be helpful to define and document the roles, responsibilities and actions of each member of the RTS decision-making team. In a RTS continuum we define three elements (figure 1), emphasising a graded, criterion-based progression, that is applicable for any sport and aligned with RTS goals. Return to participation. The athlete may be participating in rehabilitation, training (modified or unrestricted), or in sport, but at a level lower than his or her RTS goal. The athlete is physically active, but not yet ‘ready’ (medically, physically and/or psychologically) to RTS. It is possible to train to perform, but this does not automatically mean RTS. Return to sport (RTS). The athlete has returned to his or her defined sport, but is not performing at his or her desired performance level. Some athletes may be satisfied with reaching this stage, and this can represent successful RTS for that individual. Return to performance. This extends the RTS element. The athlete has gradually returned to his or her defined sport and is performing at or above his or her preinjury level. For some athletes this stage may be characterised by personal best performance or expected personal growth as it relates to performance. The three elements of the return to sport (RTS) continuum. Removal from sport does not necessarily mean that the athlete ceases all participation. Rather, the shared decision may be to modify the training and/or match load. For example, the athlete may not complete every training session, or the athlete's court time might be reduced and partly substituted with rehabilitation focused training. Decisions about reducing load, removal from sport and the subsequent RTS require the athlete, coach(es) and clinician(s) to work closely together. However, in some jurisdictions, clinicians are legally required to act on their own initiative if it is necessary to protect the health of the athlete. RTS: whose decision is it anyway? The key points regarding definitions of RTS and the RTS continuum are presented in box 1. The minimum information required to define RTS is: the sport and the level of participation the athlete aims to return to. RTS is a continuum comprising three elements: return to participation, return to sport and return to performance. In certain situations the RTS decision may be reversed to a removal from sport decision. The RTS decision should be shared among all stakeholders (except in the case of health risk to the athlete). Theoretical models can help clinicians make sense of the myriad factors that influence RTS outcomes, as well as encourage consistency and transparency in RTS decision-making. In this section, we describe the three models that may help the athlete and clinician with RTS planning, decision-making and transition. The Strategic Assessment of Risk and Risk Tolerance (StARRT) model8 is a three-step model that helps estimate the risks of different short-term and long-term outcomes associated with RTS, and factors that may affect what should be considered an acceptable risk within a particular context (figure 2). 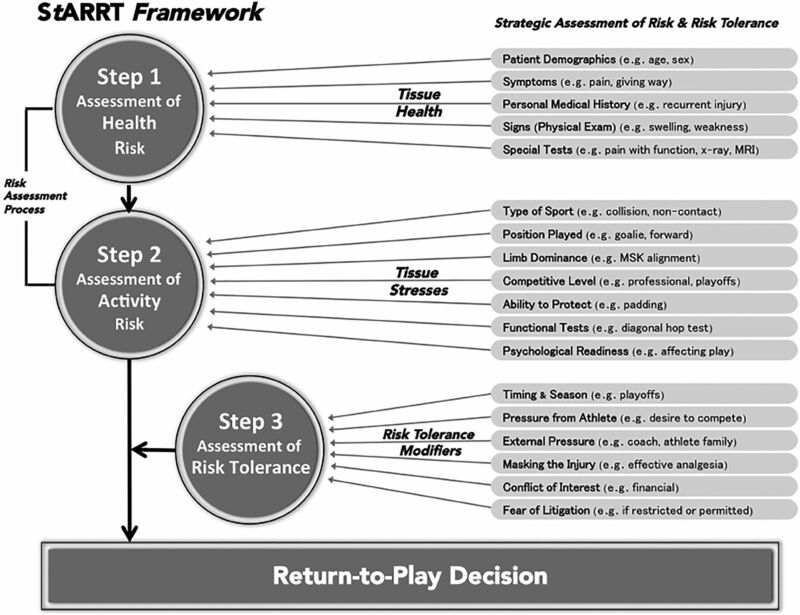 Strategic Assessment of Risk and Risk Tolerance (StARRT) framework for return to play decisions. Athletes should be cleared to RTS when the risk assessment (steps 1 and 2) is below the acceptable risk tolerance threshold (step 3), and not cleared to RTS if the risk assessment is above the risk tolerance threshold (reproduced with permission). 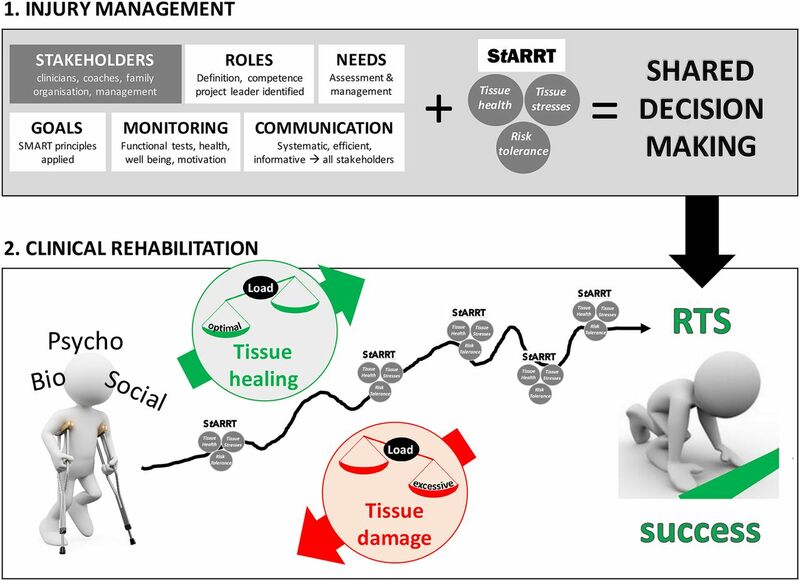 Step 1 (tissue health) of the StARRT framework synthesises information relevant to the load (stress) the tissue can absorb before injury. Step 2 (tissue stresses) synthesises information relevant to the expected cumulative load (stress) on the tissue. Step 3 (risk tolerance modifiers) synthesises information relevant to the contextual factors that influence the RTS decision-maker's tolerance for risk. Biopsychosocial approaches are common in health settings.9–12 In the athletic injury context, they provide all RTS stakeholders with a framework for considering the biological, psychological and social factors that might influence treatment and outcome after athletic injury, and might be important to consider for RTS (figure 3). Biopsychosocial model of RTS after injury.151 Examples of physical, psychological and social factors that may influence RTS are listed (reproduced with permission). Load progression is a key part of rehabilitation and RTS decision-making. Achieving and maintaining optimal loading13 are important clinical considerations. Monitoring the training load during the current training week (acute) against the average of preceding four training weeks (chronic) provides an acute:chronic workload ratio.14 This ratio might also be a useful tool in planning load progressions in RTS,14 especially when the athlete is transitioning from return to participation to RTS, and from RTS to return to performance in the RTS continuum. Still further research is needed to evaluate whether the acute:chronic workload ratio applies in a rehabilitation setting. The key points regarding how RTS models can help guide the RTS decision and transition are presented in box 2. Considering the biological, psychological and social factors influencing the RTS decision and transition can assist the clinician to optimally contribute to the shared RTS decision (figure 4). The composition of, and roles within the decision-making team should be determined as early as possible. Members of the RTS decision-making team should be prepared to regularly share information among all relevant stakeholders. Regular assessments and review of goals should be scheduled. Integrating RTS information to make an optimal decision. The top part (1) describes the management aspects that need to be addressed to lead the rehabilitation project. The bottom part (2) shows the progression of rehabilitation on a timeline, where load is progressively increased to promote tissue healing, but can be excessive and require adaptation to avoid damage. These adaptations go thorough iterations where the StARRT model is applied at different time points until eventual full RTS. Final decisions are reached by applying a shared decision-making process. Section 3: What evidence do we have to inform the clinician's contribution to the shared RTS decision? In this section, we summarise the evidence regarding RTS in commonly injured body regions. Using an appropriate combination of research evidence, athlete preference and clinical expertise,3 high-quality, intensive rehabilitation15 and a highly motivated athlete16 are important for optimal RTS. Functional and sport-specific conditioning tests play an important role in RTS decision-making,17 ,18 and many of the factors deemed important in RTS decision-making are based on prospective studies defining the risk factors for injury. Most functional test procedures are based on closed skill tasks (eg, single or triple hop, T drill, figure 8 runs), but sport requires open skills in addition to closed skills. Open skills have a reactive element to execute the motor task, usually in addition to decision-making, often in a fatigued state. Therefore, relying on closed skill tasks alone in determining readiness to RTS is not optimal. Gradual and sequential introduction of sport-specific training can be used as functional tests that include an element of protected reactive decision-making (ideally context specific).19–21 Any battery of tests assessing the athlete's readiness to RTS should consider both open and closed skills, although in some clinical contexts this may be difficult because of factors including time, space and resources. If this is the case, assessment of closed skills in conjunction with other impairment-based and functional parameters gives the clinician and the athlete a minimum level of information for RTS decision-making. Physical testing has historically received most attention in RTS decisions, but psychological readiness is also an important element for optimal RTS. Emotions including fear of reinjury and cognitive factors including self-efficacy and motivation influence RTS.22–25 The ACL-Return to Sport after Injury scale26 and the Injury Psychological Readiness to Return to Sport scale27 are evidence-based scales that may assist the clinician assess the athlete's psychological readiness to RTS after injury. Factors associated with increased risk of ACL graft rupture are young age (<20 years), continued participation in pivoting sports and the use of allografts.15 ,32 ,48–50 Athletes who have had an ACL injury retire at a younger age than athletes without previous ACL injury,51 although the reasons for this are yet to be fully elucidated. Although multiple studies have assessed the possible predictors for time to RTS,65–69 there is currently no strong evidence that MRI can predict time to RTS.65 The individual variation in time to RTS and different RTS definitions70 as well as low methodological quality and the considerable risk of bias in the current literature65 might be an explanation for this. Clinical findings are more valuable for prediction of time to RTS than MRI measures, but predicting time to RTS is inaccurate for the individual athlete.67 ,71 Except for (the relatively uncommon) total hamstring rupture, not returning to sport is not a major issue in acute hamstring injuries—close to 100% of athletes RTS after a hamstring injury. Given the association between reduced strength and adductor injury, we suggest hip adduction strength should be measured to inform RTS decision-making. There are no milestone-based criteria for RTS following Achilles tendon rupture. The time-based criteria are for non-contact sport resumption from 16 weeks following injury, and contact sports from 20 weeks after injury. Little evidence exists regarding RTS rates or time to RTS after shoulder injury. Scapular asymmetry is normal in overhead athletes.119 However, scapular upward rotation and scapular stabiliser muscle strength are hypothesised to be key factors in optimal sports performance.120 ,121 Functional performance tests for the shoulder are gaining interest. However, these tests are not yet fully explored in clinical practice,122–125 and lack normative data and cut-off values for injury prevention and RTS. RTS criteria for many common sports injuries are not based on solid scientific evidence, and lack consensus. It is unknown whether this contributes to the relative high incidence of reinjuries or relatively low percentage of athletes who return to their preinjury level. It is also unclear whether fulfilling common RTS clinical criteria predicts progression through the RTS continuum (return to participation, RTS and return to performance). However, absence of research evidence should not mean immediate cause for despair that current practice is inadequate—there are cases where high-quality clinical practice is associated with excellent clinical outcomes.129 The key points regarding evidence for RTS are presented in box 3. Time to RTS varies independent of the type and severity of injury, reflecting the challenge in accurately predicting injury prognosis and RTS timelines. RTS decisions should always use information gathered from a battery of tests mimicking the reactive elements and the decision-making steps athletes use in real sport situations. Workload may be linked to reinjury, so should be taken into consideration when making RTS decisions. Psychological factors should be taken into account during rehabilitation and at the time the athlete is making the transition back to sport. Consensus is needed regarding the RTS criteria for common athletic injuries. A clear definition of RTS is important, and researchers should consider using the RTS continuum (figure 1) as a basis for their definition. In some research contexts it may be necessary to elaborate on some elements of the RTS continuum. For example, for return to participation, to report the number of athletes who return to a different sport than their preinjury or the number who return to the preinjury sport but at a lower level (eg, was playing national competition basketball, now playing in a regional competition). Researchers should also report the number of athletes who stop playing sport. Long-term follow-up is needed to examine the impact of injury on long-term participation in sport. The length of follow-up needs to be relevant to the injury studied (eg, after Bankart repair, 1 year might be considered short-term follow-up, while after muscle injury, 1 year might be considered long-term follow-up), and defined in advance by the researcher. Given that a sizeable proportion of athletes cease participation in their preinjury sport by the medium-term following injury,82 ,136 it is an important avenue for future research to establish whether these athletes retire from sport or whether they change sports. 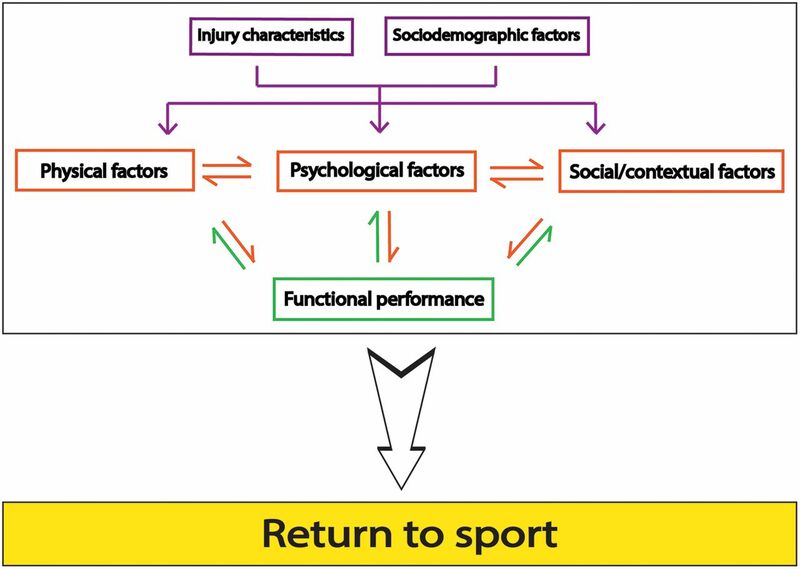 Reasons for participating or not participating in sport vary greatly between different populations and sporting activities.27 ,137 Future studies should seek to establish why some athletes do not RTS and if non-return is related to reasons for playing sport initially, and explore whether athletes are satisfied with their postinjury participation. Consistent reporting of impairment-based and activity-based measures, and patient (athlete)-reported outcome measures during recovery and rehabilitation may help identify subgroups at high, moderate and low risk of reinjury. Early identification of these subgroups may allow targeted interventions to address risk factors (eg, specific strengthening programmes to address subcomponents of strength or psychological input for at-risk groups), which may result in better long-term outcomes. Quantification of risk may help categorise athletes who are not ready to RTS, those who require supervision, and those who are ready to RTS. Table 1 summarises some of the key factors that may influence RTS outcome and highlights the multifactorial nature of RTS. Interrelationships between factors and the impact of these relationships on RTS remain unclear, and warrant further investigation. Tests may be performed prior to injury as a benchmark, then at four key time points: (1) immediately after injury (ie, diagnostic tests), (2) through the course of rehabilitation (to monitor progression), (3) at the time of clearance to RTS, (4) after RTS to measure performance and reinjury risk. Future studies to consider the prognostic validity of clinical tests for RTS and reinjury are underway. Areas that warrant further investigation to establish the relationship to RTS outcomes and interrelationships between factors include strength, range of motion, neuromuscular control, psychosocial factors and skill execution. Research investigating the influence of range of motion on RTS outcomes has been largely equivocal, although there is evidence in baseball players of a relationship between shoulder injury and glenohumeral internal and external rotation deficits.113 ,142 ,143 Future studies should evaluate the role of sport-specific range of motion through multiplanar functional movements. Most of the research examining the impact of psychological factors on RTS has been of cross-sectional design. Future studies should use prognostic designs to consider the temporal relationship between key psychological factors and RTS. Another important question to consider is whether interventions that target psychological factors can change RTS outcomes. Future studies should assess performance measures associated with the athlete's sport. Ideally, this research should include objective (eg, GPS, game statistics) and subjective measures of loading and performance (eg, session rate of perceived exertion, satisfaction). Using consistent tests and descriptions will improve the ability to make comparisons between studies. It might then be possible to perform meta-analyses and compare across a variety of sports and subgroups. There are many avenues to be pursued in future research. In box 4 we provide some recommendations on priorities for future RTS research. Standardised approach to injury definition including the nature of the injury, severity and whether it is a primary or recurrent injury. Standardised approach to reporting preinjury sporting activity to include the level of sport played, volume and intensity. Standardised reporting of RTS outcomes (eg, performance, (re)injury risk, satisfaction) and follow-up. Design and validation of tools to accurately measure RTS. Identification of specific sub-groups within injury types that have different RTS outcomes. Combining information from a biological, psychological and social standpoint, while considering the risks can help all RTS decision-makers—whether they be clinicians, athletes, coaches or other stakeholders—make optimal decisions. Integrating clinical expertise, research evidence and athlete preferences is important for RTS decision-making and for longer-term RTS success. RTS criteria for many common injuries are not based on solid scientific evidence. Future research should focus on a standardised approach to defining, measuring and reporting of RTS outcomes, and on identifying the prognostic factors for RTS. The authors acknowledge and thank Dr. Ian Shrier for his contribution to the consensus discussion and his comments on the earlier versions of the manuscript. No authors listed]. The team physician and return-to-play issues: a consensus statement. Med Sci Sports Exerc 2002;34:1212–14.
. Twenty-five years with the biopsychosocial model of low back pain—is it time to celebrate? A report from the Twelfth International Forum for Primary Care Research on Low Back Pain. Spine 2013;38:2118–23. ., MOON Group. Descriptive epidemiology of the Multicenter ACL Revision Study (MARS) cohort. Am J Sports Med 2010;38:1979–86.
. Eccentric and isometric hip adduction strength in male soccer players with and without adductor-related groin pain. An assessor-blinded comparison. Orthop J Sports Med 2014;2:2325967114521778.
. The association of hip strength and flexibility with the incidence of adductor muscle strains in professional ice hockey players. Am J Sports Med 2001;29:124–8.
. Acute rupture of tendon Achilles. A prospective randomised study of comparison between surgical and non-surgical treatment. J Bone Joint Surg Br 2001;83:843–8.
. A proposed return to sport program for patients with midportion Achilles tendinopathy: rationale and implementation. J Orthop Sports Phys Ther 2015;21:1–42.
. Epidemiology of injury in Olympic sports, volume XVI. Oxford, UK: Wiley-Blackwell, 2009.
. Exploration of the y-balance test for assessment of upper quarter closed kinetic chain performance. Int J Sports Phys Ther 2012;7:139–47.
. Chronic ankle instability does not affect lower extremity functional performance. J Athl Train 2002;37:507–11. Competing interests BJSM covered the cost of travel to the Bern congress for CLA and SG. KMK is the Editor-in-Chief of BJSM.